You probably know that we should aim to be physically active at least 5 days a week, for at least 30 minutes. I always encourage my personal training clients to make sure at least two of those sessions occur outdoors and with familly or friends. That is what active living is all about! The winter season offers tons of fun activities that you can do outdoors with your family and you can burn a whole lot of calories while you are at it. Here are a couple of ways to sneak a workout into your winter family fun (and your kids won’t even notice). If we personal trainers could install hills in the gym we’d have you lunging up them. Offer to haul/lunge the tobaggan up the hill for the kids for an awesome workout. Stronger types can haul the kids too! Awesome for the glutes and thighs and cardiovascular conditioning. Have snow races with the kids. If you sprint up a hill and your sprint lasts approximately 30 seconds, repeat that 7 times (with 60-90 seconds of light movement between sprints) and you have the ideal prescription for ultimate fat-burning and cardiovascular conditioning. Ice skating is great way to work the legs and especially the glutes. Every couple of laps around the rink do a set of 15 squats, side leg raises, pushups off the bench. Or, a family day of skiing, snowboarding, snowshoeing, or cross country skiing is a great reason to skip the gym! 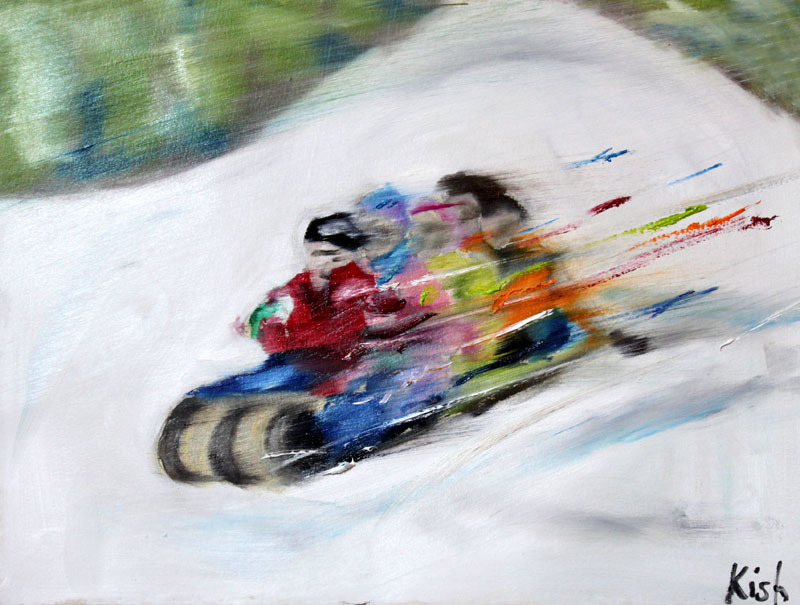 I encourage you to visit the Kish Studios online gallery for a fascinating exploration of Canadian sport, fitness and active living through art.